The orthodox church of St. Stefan in Istanbul (Fig. 1) is situated near the Golden Horn in the historical part of the peninsula between the Fener and Balat districts. It is a monument of national importance in the Republic of Turkey, and is under the supervision of the Bulgarian Churches Foundation in Istanbul. On the Balkans, however, shared maintenance between Bulgaria and Turkey has led to problems for many architectural monuments. 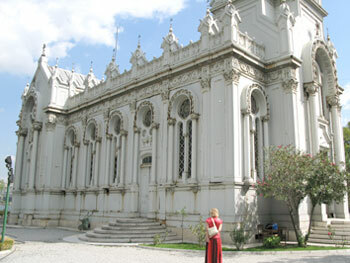 The temple St Stefan, like many other Bulgarian religious buildings in Turkey and Turkish religious buildings in Bulgaria, has the status of an architectural monument, and has been maintained by both countries according to the Bilateral Agreement for Cultural, Scientific and Educational Cooperation (1997) between the governments of the Republic of Bulgaria and the Republic of Turkey. Later, based on the Bilateral Agreement, a Protocol (1998) and a Program for Bilateral Cooperation on Maintenance of Immovable Cultural Heritage (2002) were signed. The Ministries of Culture of both countries and their agencies are responsible for assigning and controlling the identification and documentation, analyses, investigations, design, preservation and restoration, and also for putting forward proposals for the World Heritage Committee. In addition to the maintenance work, numerous theoretical studies should be carried out by civil organizations and experts as an important part of the research and documentation, and as a token of the concern of the governments for these architectural monuments. These studies and analyses aim to discover initial data about the monuments. The information presented in this paper was gathered as a part of this process. It should serve as a basis for planning a more substantial survey and restoration proposal which is necessary in order to safeguard this unique monument. The church of St Stefan in its present form was built between December 1895 and July 1896, funded by the Bulgarian government after liberation from Ottoman rule (Fig. 2). The designer was Hovsep Aznavur, an Istanbul architect of Armenian origin. The church itself was constructed by the Rudolf Phillip Waagner Company, and was made with a cast iron façade and steel sheets or rolled sections for the structural elements and ornaments. 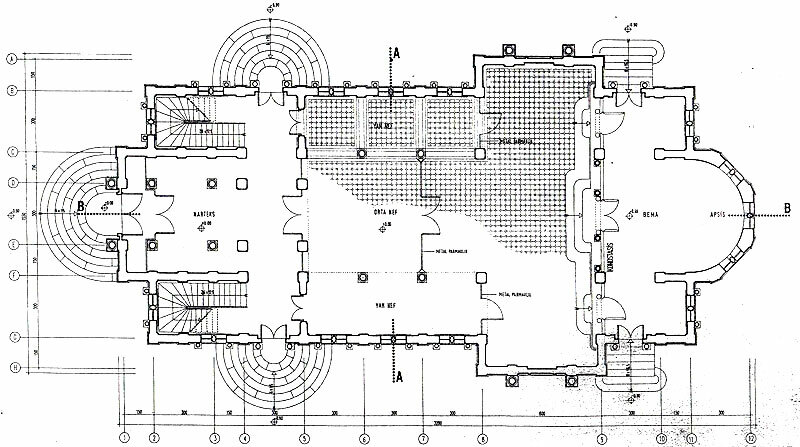 According to its plan, the temple is a single-apse three-nave basilica with a short transept and empora, and with an eclectic style of façade decoration (Fig. 3). The terrain of the church is situated on the bank of a gulf. The land is subject to flooding, so it had to be embanked in the 1850s with piles 7m in length and with stones. However, 30 years later the embankment was damaged. During the 1890s the place had to be drifted again because of high waters. In the 1890s, the commission found the necessary resources and resumed its plans to build a church. Several investigations were conducted into the main causes of the floods in the peninsula. The analyses showed that the enbankment is 23 m depth, which made the subsoil very unstable. This ground was not able to carry the weight of the stone-made church that had been originally been planned. The only possible building was an iron structure. The commission therefore decided to build a metal structure, using the foundations of the stone church that had already been started. 650 new oaks piles were fixed to the ground. These were 21,5 to 23,5 m in length and 0,4 meters in diameter. The placement of the piles is not specified in the archive documents. A steam hammer was delivered from England for the necessary works. The area around the temple was to have been forested, according to the original plans of the Istanbul engineers and architects, but this was never implemented. The names of thе engineers and architects are Antoine N. Perpignani, Alphonse Cingria, Gabriel Tedeschi (Tedeschie), Ailerli, Alexandre Vallaury and Frangoulis Eustratious Mavrogordato (Mavrogordas). The personality of every one of them is not well known for this time. We know that some of them create the European face of the capital of the Ottoman Empire (History 2008). The last one is a nephew of Stefan Bogoridi, who donate the land (Genealogy without year). The piles were to be joined together by horizontal oak beams, each with a square profile of 0,25 m by 0,25 m. A splash of hydrated lime was made over the piles, on top of which the actual stone foundations were laid. The stone foundations were covered with concrete. Experts recommended to place a second layer of oak elements over the concrete. Finally a steel grid was placed there. This provided the foundation on which the structure of the church temple could be erected (Rapport 1889: 32-35). The church has a typical steel bearing structure built on all sides on the concrete walls of the basement and on the concrete half-columns inside the basement. According Turkish architects Prof. Hasan Kuruyazici and Mete Tapan, the church of St Stefan has concrete pillars, but these are probably stone blocks (the basement was not accessible and only photographic details of the basement are available; these do not enable a verification to be carried out). Steel sheets were placed on them and were stabilized with angle elements. The contact points were reinforced by edge-iron elements. Transverse pieces and beams were welded to this system1 (Ivanova 2007, comp. with Kuruyazici, Tapan 1998). These construction features are for banking the terrain, and also because there are frequent earthquakes, a problem is not, however, mentioned in the archive documents. On May 7th 1894, a test was made of the quality of the metal for the construction of the church. The test was performed at the Royal Imperial Museum for Technology in Vienna (Royal 1894: 118). A contemporary analysis of this test, and also an analysis of the present state of the steel plates, prepared by Radi Ganev, are presented below. According to Austrian magazines from 1895, the Waagner factory was given total freedom in projecting the bearing structures of the church. Engineer Havlichek was the leading expert who supervised the work (Gassebner 1895). Some documentary archives suggest that architect Hosvep Aznavour had prepared the architectural project in the spirit of modern architectural thinking. The church of St Stefan is one of a number of examples of iron or steel churches built around the world (Ivanova 2008). Its construction is the result of a revolution in the area of construction and the application of new materials. In 1871 in Dinaburg/Daugavpils, Lithuania, the Church of the Transfiguration of God (Fig. 4) was erected as a soldier’s chapel2 (Church of the Transfiguration, Petrovskyi 2005). The church of St John Chrysostom was built in Kiev, Ukraine in 1871 (Fontanius 2003). The French engineer Gustave Eiffel built some steel churches in Latin America and in East Asia in the 1880s and 1890s. These are examples of the frequent occurrence of steel churches as an aspect of industrial development. Eiffel’s office projected not only churches but also synagogue buildings, galleries and railway structures in European countries, and in towns in South America and Asia. They have been restored and are well preserved. 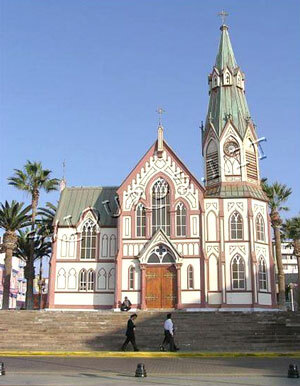 The church of St Marco in Arija, Chile (1875) is a most remarkable pre-fabricated structure designed by Eiffel. It is neo-gothic in style. The temple has not corrosion at all (Fig. 5). 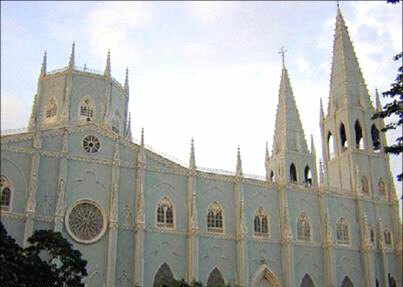 The church of St. Sebastian in Manila, the Philippines (1891) was created by the Spanish architect Genero Palacios, who planned to build a church resistant to fire and to earthquakes, made entirely of steel in neo-gothic and neo-baroque styles (Fig. 7). Its steel parts were made by the Societe Anonyme des Enterprises de Travaux Publiques in Brussels, Belgium (Boyken 1989: 206-207). The history of the construction of the temple in Grecia, Costa Rica (1897) is similar to that of the Bulgarian church in Istanbul (Fig. 8). There were three periods of construction - a wooden church, to which brick masonry was later added and then a steel church was built. 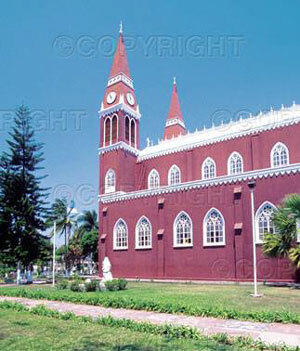 After the brick masonry reconstruction, the church was destroyed in an earthquake in 1888. 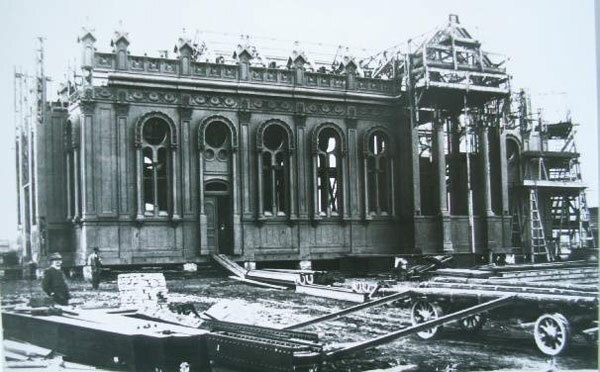 In 1890 it was decided that a new church should be built with a metal structure so that it would be earthquake-proof. In 1891, a Belgian construction company signed a contract to build a new church. This masterpiece in neo-gothic stile was completed in 1897. All of these churches are located near an ocean and are exposed to atmosphere conditions like those at the church of St Stefan on the Bosporus. Their good appearance shows that steel monuments in a high humidity environment respond well to regular maintenance. The last example of a successful restoration is the church of Sainte-Barbe in Crusnes, France. This church was a prototype for churches to be sold to Аfrican missions. The church of Sainte-Barbe in Crusnes was built in 1938-1939 by the architects Claude Robbe and Alphonse Fenaux. All the materials used to build the church originated from the Lorraine steel basin. The project was broken off due to the second world war. 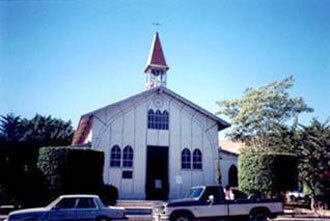 This church was listed as a Cultural Heritage Monument in 1990. According to German researcher Immo Boyken (Boyken 1989: 206-207), the Bulgarian church is better able to withstand damp conditions because there is ventilation between the inside and outside panels. 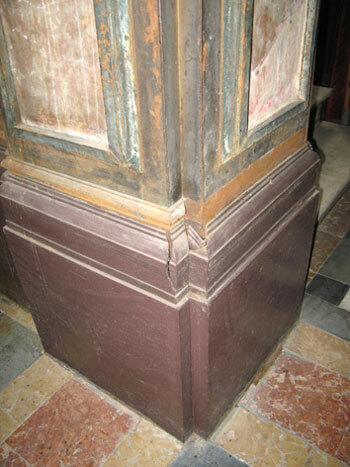 In the church in Crusnes, the columns block free space circulation. According to Boyken, the structure of the Bulgarian church has another advantage: all parts of the structure are connected with rivets, and it is a solid entity. It has uniformly distributed pressure on the substructure. In the event of an earthquake, this system is more stable. According to Boyken, a problem of the church is that there are no gaps for flux in the "solid dependent body". The absence of gaps leads to a danger of deep cracks. The cracks have not burst the rivets, as they are placed across the iron parts. It is not clear which parts Boyken is referring to here. His conclusion is based only on photographs that he received from Wolfgang Muller-Winner (Boyken 1989: 208). The condition of the Bulgarian church is in need of improvement. As it is one of the last monuments of iron or steel Christian church architecture in the world, it deserves to be carefully restored. A sheet of steel 380 х 80 mm in size and 4 mm in thickness which formed part of the exterior facing of the building was sampled for material investigations. In 1894, the trusses and the details of the church were made and the church building was assembled on a trial basis in the courtyard of the Austrian firm Rudolf Philipp Waagner, so the structure is more than 110 years old. In June 1894, the designers of the church, the architects Hovsep Aznavour and Yanaki Shamardzhiev from the Ministry of Public Buildings, Roads and Communications, were sent to Vienna to obtain approval for the works until that time. High quality in the construction of the church of St Stefan was assured by the fact that the steel to be used in it had to be subjected laboratory tests. 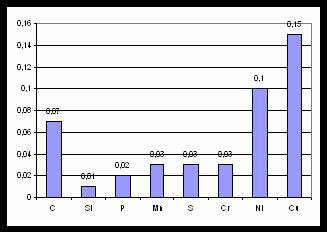 A spectrometric analysis of the investigated steel was made using a device manufactured by Spectrolab (Germany), and the chemical composition data is shown in Table 4. Τhe sample presented here and shown in Fig. 9 contains steel corresponding to grade St K 35 with No. 1.0208, according to the DIN 17115 standard for RSt 35-2 steel with mechanical performance sB = 340¸410N/mm2 and d = 30%. The Bulgarian variant of this steel is the 08 Kp grade, which is a construction steel of lower class and price (Kissyov 1965). A novel and scientific approach. The data shown in Table 1 enables a comparison for the sizes of the test samples submitted to tensile testing. The thickness may be taken as 10 mm for each sample, on an average. The width which was deacriced in the Protocol is with 17-18 mm wider than the standard. The overall length is also greater, also due to the different manner of clamping the edges of the sample in the measuring device. The most important and most general size for testing, the working length of 200 mm, has remained unchanged for more than 110 years, and is still used in present-day standards. For this reason, the results given in Table 2 can be considered authentic. REMARK: The dimensions in Table 2 are converted to SI. On the basis of Table 2 and the performance given in the protocol, a choice can be made among present-day steels. When choosing the yield point, steel St 5 corresponds to the performances, according to the tables for strength of materials (Kissyov 1965). Manganese steel 40 G corresponds to the results for rupture strength. The difference is explained by the requirement for the use of high quality steel, and probably by the presence in the ore of natural doping elements such as manganese. The analysis shows that we can rely on tha data obtained in the Protocol 1894. The latter has high reliability both for restoration of the tensile test diagram, and for the qualities of the steels used. According to the existing documentation of the Bulgarian Exarchate (Rapport 1889: 32-35), exterior painting was carried out in 1924 and 1939, while major work was done in 1946, in the 1970s, and in 1991. 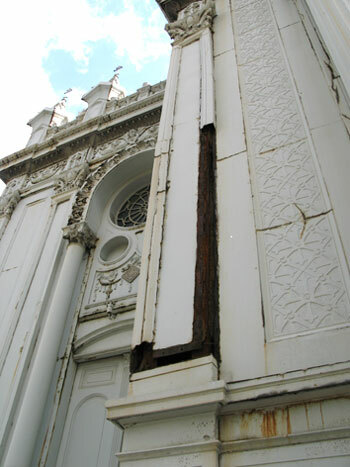 In order to determine the properties of the coating on the steel structure of the church of St Stefan, it is necessary to choose a method for evaluating and testing that will enable an analysis of the protective properties of the coatings, and of the condition of the unprotected metallic surface. The evaluation method depends on the purpose of the investigation. 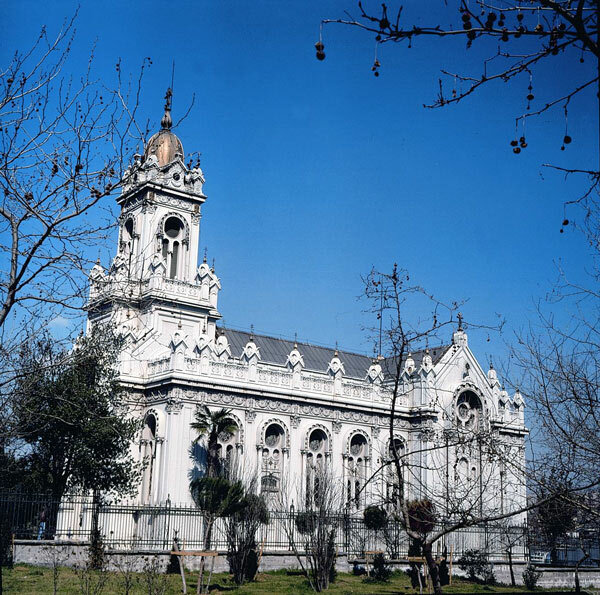 One of the main tasks is to categorize the changes in the performance of the protected surface and the unprotected surface in the course of the ageing process under various atmospheric conditions, complemented by salty moisture as the church is located on the shore of the Bosporus. The first evaluation is based on European standard EN ISO 4628-1, which establishes the system for determining the defects and the intensity of the degradation of the appearance of the coatings, and contains the main principles of the system. (European Standard EN ISO without year) The quality of the film, with the type of destruction and the changes in colour due to ageing and weathering were determined visually or by using a х10 magnifying glass. When the assessed surface contains defects varying in size, the most significant ones are marked. These are defects that are sufficiently numerous to be representative of the surface that is being tested. The results are shown in Tables 3 and 4. An analysis of Table 3 and Table 4 shows that the coating performs poorly. This is explained by the degradation of the film structure under the impact of temperature, light and moisture, which has led to a linear rise in the energy of destruction and internal pressures (Ganev et al. 1998). Data collected over many years in natural and accelerated tests of similar metal structures shows that obtaining hydrogen links and hydroxyl groups is a factor in destroying the initial structure of the coating. Negative transformations occurring in the polymer matrix during the ageing process at the interaction boundary between the coating and the metal substrate lead to a decrease in adhesion and, finally, to the appearance of corrosion. Further major difficulties, e.g. the long-term properties of the coating, and especially the lack of a control from the period of applying, suggested that another evaluation, according to the EN ISO 2409 standard should be carried out (European Standard EN ISO awithout year ). For this purpose, cross-cuts were made on to the sample below 90° in two directions. In the grid that was obtained, a count was made of the rectangles in which cracking, detachment or surface blisters were observed. Adhesion was defined using standard grades 0 to 5, as shown in Fig. 11. 0 - No degradation, i. e. no visible degradation. 1 - Very weak, i. e. hardly visible degradation. 2. Lightly, i. e. clearly visible degradation. 3 - Clearly visible to the naked eye, up to 0,5 mm. 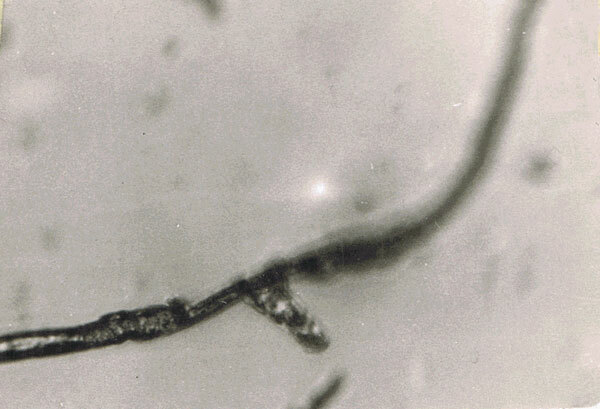 4 - Clearly visible to the naked eye, from 0,5 to 5 mm. 5 - Clearly visible to the naked eye, larger than 5 mm. The data, compared with a standard, shows that the adhesion is of grade 3, 4, 5, and confirms the results obtained by applying the EN ISO 4628-1 standard. The analysis confirms the destruction processes occurring in the coating. The polymer coating interacts with the atmospheric moisture in the form of rain, dew, mist, and the ageing process, and has a very complicated mechanism with irreversible consequences. This is because, as the composition of the film ages, its structure also changes. The intermolecular interactions weaken, and the separate components are exhausted, leading to the appearance of micro and macro cracks. It is therefore impossible to use generalized analytical expressions to describe the processes in the film as it interacts with the moisture. Resolving the task during a trial to forecast the workability of the coating is made complicated by the fact that components of various chemical compositions and structures in the varnish-paint system determine the performance of the coating. The adhesion strengths of the film with a solid non-deformable substrate are an important factor in defining its performance. A quality test on the investigated sample also determines the resistance of the coating to filiform corrosion (EN ISO 4623-1 without year), due to the poor condition of some metallic details. This standard is applied because mechanical damage or adhesion breakage of the coating film on the steel surface creates conditions for the occurrence of corrosion. Corrosion tends to develop in moist conditions, or salt traces are found in places where the film is broken. For this purpose, two cuts least 30 mm in length are made perpendicular to each another. It is verified whether the cutting edge of the instrument penetrates under the coating. 3 % solutions of sodium chlorine are poured on to the cuts and the cuts are placed for 16 hours in a chamber with a regime characterized by 40% moisture and a temperature of 40 °С. The filiform corrosion is assessed against the EN ISO 4628-10 standard and placed into one of three categories: "weak", "moderate" and "strong". In our case, the corrosion of the investigated sample was moderate to strong. (EN ISO 4628-10 without year) The initial roof sheet iron size had been 4 mm, but one of its edges was so corroded that its thickness could not be seen. The results of the long-year impact of the corrosion processes are shown in Fig. 12. Together with the impact of corrosion and long-term use, there are other important deformation processes and other processes dependent on the duration of the corrosive impact of the adverse environment.Fatigue cracks form in the event of high frequency effects, e.g. earthquakes (Fig. 13). The cracks spread in the areas of pressure concentrations on the surface and at a depth. The environment enters into contact with surface cracks, leading to a direct influence on their development, through physical and chemical mechanisms. Marine moisture and mist are a problem for all types of steel structures. They act destructively on reinforced concrete and natural stone, and also on steel elements (Dahl 1983, Troshchenko 1981). Cyclic alternation of moist and dry air is favorable for patina formation. When the moisture is constantly high, no patina cannot form and, logically, the steel corrodes at the rate of common carbon steel. Construction steels with a low carbon content, close to the investigated values, has low long-term fatigue resistance. The church has been visually inspected several times in recent years. The latest visit, in 2007, discovered many severe defects and failures which place this building in the heavily damaged category. Some particularly significant cases will be presented here. As mentioned above, the subsoil is insufficiently stable and remarkable signs of additional and uneven subsidence are visible. Comparing the structural assembly photograph with the present-day situation, the reader can easily see the wide gap that has developed between the stone footing masonry and the iron sheet cladding, and can see that it has several times been repaired (filled) with welded steel strips (Fig. 14). This masonry has not only sunk into the subsoil but is also tilted out of the building, as the terrain subsides more than the building underpinned with long piles. It seems that the southern side and the adjacent pavement have deformed more than the northern side. Of course, a steel-framed structure is less sensitive to uneven settlement. 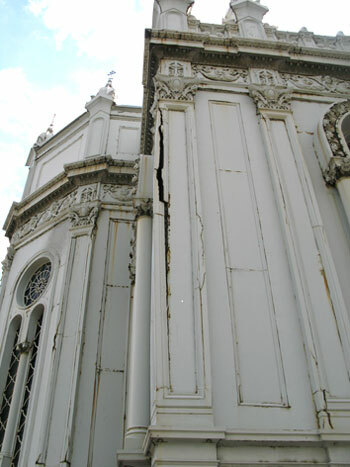 However, the brittle cast iron elements exhibit severe cracks and heavy parts of the façade panels may spall. In fact, there are numerous signs of fallen elements and very large cracks in rather thin (7 mm in thickness) cast iron parts (Fig. 15, Fig. 16, Fig. 17). The hidden steel structural elements and the cladding panels are highly corroded in details with water traps and elements channelling rain or condensed water. However, the paint on the façade has been renewed several times during the lifetime of the church, and is generally in better condition than the surface coating inside the building. Similarly, in well ventilated spaces without high condensation (the space under the roof, and even parts of the basement) the historical paints still protect the structures well against atmospheric corrosion. 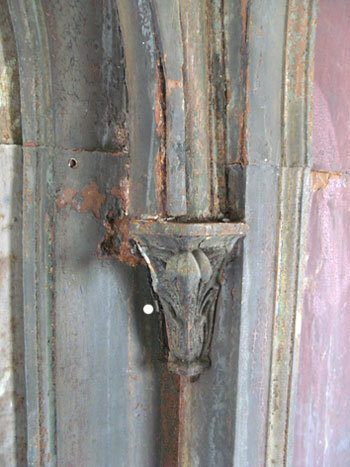 Cracked and heavily damaged cast iron elements are also visible in the interior parts of the church, (Fig. 18, Fig. 19). The interior suffers above all from very high corrosion. It seems that the surfaces have their original paints or, rather, some remains of the original paints, (Fig. 20), which have lost their protective function and large areas of steel sheets are corroded over the whole surface area. 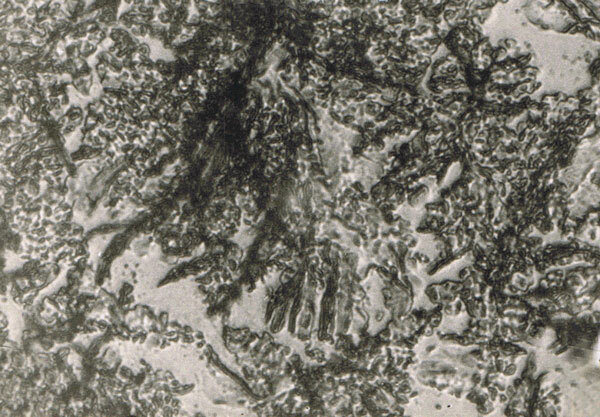 "Dry" joints between plates have been open to condensed water and vapour as they run off, and their edges or supporting structures under the sheets are heavily corroded with typical expansion of the corrosion products, (Fig. 21). Some parts are totally damaged and the original material has been completely lost. 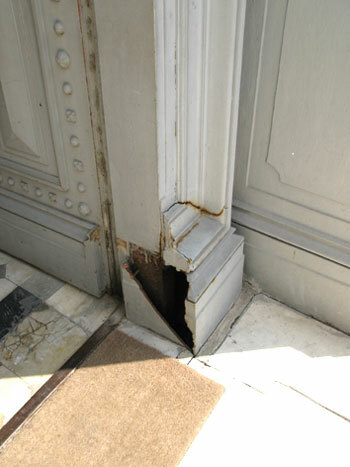 Iron oxides have also caused the deformation of some slender steel elements, and there are cracks in corners. 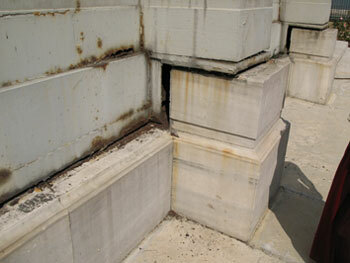 The structure exhibits traces of inexpert welding repairs to some damaged parts. The stone veneer cladding in the interior wall panels is missing or damaged. The original polychromy is still apparent. 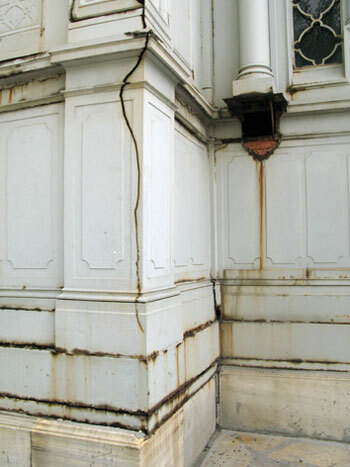 The gutters are not accessible for visual inspection, and there are probably some small defects that are causing corrosion of the façade elements, as has been experienced in some similar cases of combined steel framing and cast iron cladding (Drdácký et al. 1984). On the roof, too, some details are damaged by corrosion. Various low-quality "improvements", e.g. illumination and lightning protection, have been carried out, leading to an increased threat of accelerated deterioration process. Metals came into wider application as building materials at the end of the 18th century. Their clear technological advantages led to a range of possible applications as prefabricated elements, and also as building trusses and elements or assembling structures covering large spaces easily and rapidly. The typological range of metal structures includes churches, especially for export to countries with a low level of construction skills and/or places with a high risk of seismic events. Major design offices and steel structure manufacturers were involved in this work. 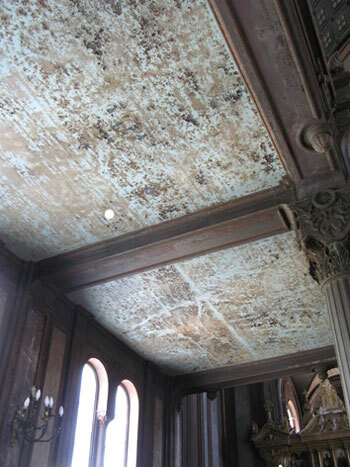 In order to ensure high quality of the metal structures in church buildings, the companies used the latest methods. The application of tensile tests by the Waagner company in Vienna, presented here, is an example of the exploitation of one of the first internationally-approved methods for the mechanical testing of materials. However, only a few examples of these prefabricated iron or steel structures have survived, and they need constant maintenance because corrosion is the main threat to the lifetime of metal buildings. The church of St Stefan in Istanbul is a major architectural and technical monument endangered by the site conditions and also by long-neglected maintenance. The unstable subsoil conditions and strong weathering attacks call for urgent restoration of this building, which shows very heavy defects and failures and is also beginning to be dangerous for its users. This historic building provides an opportunity for a truly international restoration campaign aimed at safeguarding an important European/Asian monument which brought together the industrial skills and efforts of several countries in implementing a technically complicated project. Restoring this church building will require a thorough survey of the structural condition using modern equipment and probes, numerical modelling of the structural behaviour in emergency situations, and stabilization of the building foundations. Partial dismantling and replacement of the cast iron and steel sheet cladding will also clearly be necessary. Boyken 1989: Boyken, I. Vorgefertigte Eisenkirchen, Jahrbuch des Sonderforschungsbereiches 315, Erhalten historisch bedeutsamer Bauwerke, 1988, Ernst&Sohn, Berlin, 1989. Church of the Transfiguration without year: Долгий век православного собора. // D-pils.lv <http://www.d-pils.lv/view_article.php?article=34188> (06.10.2010). Dahl 1983: Dahl, W. Verhalten von Stahl bei schwingenden Beanspruchung. Düsseldorf: Verlag ST MBH, 1983. Drdácký et al. 1984: Drdácký, M., Jíra, J., Janeček, P. Renovation of the Steel Structure of Maxim Gorki Collonade in Mariánské Lázně. // Proceedings of the International Conference "Konstrukcje metalowe", Gdansk, May 1984, vol. 4, pp. 277-284. European Standard BDS EN 10002-1 2004: European Standard BDS EN 10002-1. Metals. Tensile testing. Part 1: Test method at room temperature. 2004. European Standard EN ISO 4628-1 without year: European Standard EN ISO 4628-1 Paints and varnishes. Evaluation of degradation of coatings. Designation of quantity and size of defects, and of intensity of uniform changes in appearance. Without year. European Standard EN ISO without year: European Standard EN ISO Paints and varnishes. Cross-cut test. Without year. European Standard EN ISO 4623 without year: European Standard EN ISO 4623-1 Paints and varnishes. Determination of resistance to filiform corrosion. Without year. European Standard EN ISO 4628-10 without year: European Standard EN ISO 4628-10 Paints and varnishes. Evaluation of degradation of coatings. Designation of quantity and size of defects, and of intensity of uniform changes in appearance. Part 10: Assessment of degree of filiform corrosion. Without year. Fontanius 2003: Фонтаний, Ек. Где живем? Была когда-то в Киеве церковь из... железа. // Сегодня, 28.06.2003, № 1487, Полоса 4. Ganev et al. 1998: Ganev, R., Glavtchev, I., Novakov. P. Self-extinguishing and high-flammability-point coatings based on waste pyroxylin powder blended with halogen-containing polymers. // Journal of Surface Coatings International, England, 1998, v. 81, No. 11 <http://resources.metapress.com/pdf-preview.axd?code=x16562525l2505k6&size=largest> (07.10.2010). Gassebner 1895: Gassebner, L. Zeitschrift des Österreichischen Ingenieur-und Architekten-Vereins. // Jahrgang, 1, 47, Wien, 1895. Иванова 2010: Иванова, Бл. Неосъщественият каменен храм "Св. Троица" на брега на Златния рог и архитектите Фосати. // Електронно списание LiterNet, 27.02.2010, № 2 (123) <https://liternet.bg/publish22/b_ivanova/neosyshtestveniiat.htm> (06.10.2010). Genealogy without year: Pandely (Laurentios) Mavrogordatos. Without year. // Ghyka le site de la Famille <http://www.ghyka.com/Familles/Mavrocordat/Mavrocordat_G_1%2B2.pdf> (06.10.2010). Sisli without year: Sisli Greek Orthodox Cemetery (Kolakis 2009). Without year. // Agelasto family Genealogy Pages <http://www.agelastos.com/genealogy/showalbum.php?albumID=22> (06.10.2010). Ivanova 2007: Ivanova, Bl. Construction of the temple St Stefan in Istanbul (Preliminary Notes). // Reports. Proceedings International Science Conference VSU. May 15th-16th 2007, pp. 51-56. Ivanova 2008: Ivanova, Bl. The Temple St Stefan in Istanbul and steel temple architecture during the 19th century (Situating the Monuments). // Reports. Proceedings of the International Science Conference VSU. May 29th-30th 2008, pp. 66-71. Kissyov 1965: Кисьов И. Таблици по съпротивление на материалите. София: ДИ "Техника", 1965. Kuruyazici, Tapan 1998: Kuruyazici, H., Tapan, M. Sveti Stefan Bulgar Kilisesi. Istanbul, 1998. Petrovskyi 2005: Петровский, Юрий. Даугавпилсский кафедральный собор Cвятых благоверных князей Бориса и Глеба отмечает свое 100-летие. // Наша газета, 04.08.2005 <http://www.nasha.lv/article.php?id=555942&date=4-8-2005> (07.10.2010). Rapport 1889: Rapport concernant les consolidation à operer au terrain de l'Eglise Bulgare projetée à Phanar. Constantinople 26 Septembre 1889. // Central State Archive, 1889, fund 246, inv. 1, arch. unity 1. Royal 1894: Royal Impérial Musée Technologique des Métiers. Vienne, IX Währingerstrasse 59. Établissement pour l'examen de matériel de construction et de machines. Certificat. // Central State Archive, 1894, fund 166 K, list 1, archive unity 120. Troshchenko 1981: Трошченко, В. Т. Деформирование и разрушение металлов при многоцикловом нагружении. Киев: Наукова думка, 1981. History 2008: History of Istanbul after the Conquest. // Hoşgildiniz... FM ile ilgili ve diğer aradiğiniz en güncel dökümanlar bu sitede..., 22.12.2008 <http://fmanager2008.blogcu.com/history-of-istanbul-after-the-conquest/4634298> (07.10.2010).